The Little Cottonwood Canyon Challenge is a 24.4-mile ride that travels along one of the Wasatch Front’s most famous routes, tackling a well-known climb. The climb, in fact, has been featured in the penultimate stage of the annual Tour of Utah professional bicycle race. The climb, commonly referred to as the “Snowbird Hillclimb,” is the featured segment in the Tour’s so-called “queen stage.” Whereas the Tour of Utah stage begins in Park City, tackling two or three other major climbs before arriving at the base of Little Cottonwood, the “Snowbird Hillclimb,” which is open to the public, involves the canyon climb only. The fastest riders have zipped up Little Cottonwood in just above 43 minutes. (Please note that the races traditionally end at Snowbird, rather than at Alta, which is where this ride takes you). Start the ride to the south of the canyon, in the city of Sandy, at Hidden Valley Park – located at 11700 South Wasatch Boulevard. If you are driving in, be careful to park in the park’s parking lot, and not the adjacent church’s. The park is at an elevation of 5,111 feet, and is the low point of the ride. Exit the park, turn right and head north on Wasatch, as it curves and rolls it way along the “Bench,” at the base of the Wasatch Mountains. There is a bike lane. Sandy, with a population of just over 89,000 in 2012, is Utah’s sixth-largest city, and is home to the Real Salt Lake pro soccer team. At the 2.7-mile mark, at a traffic signal, turn right onto Little Cottonwood Road (State Route 209). The road is a gradual uphill toward the mouth of the canyon. Turn right at mile 3.9, onto State Route 210, also known as Little Cottonwood Canyon Road. From here, at an elevation of 5,397 feet, it is a steady climb – quite steep at times – to the end of the road in Alta, at an elevation of 8,729 feet. 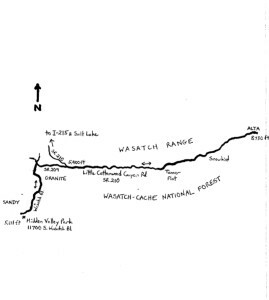 Enter the Wasatch-Cache National Forest at mile 4.0. An overhead, changeable message sign provides canyon road conditions, which is especially important during the winter season (November through April). As a general rule, Little Cottonwood Canyon Road is plowed throughout the winter, to enable access to the ski resorts at Snowbird and Alta. The road may not be suitable for cycling during those times of the year, however. 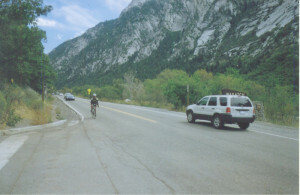 The average gradient of Little Cottonwood Canyon Road ranges from 8% to 9% for the entire length of the 8.3-mile climb. It is a two-lane road through most of the canyon, except for a few three-lane segments, designed for uphill passing. There are no “false crests,” so be prepared for a steady ascent. Easing the intensity of the effort, somewhat, is the fact that the road is a State Scenic Byway. You will see a variety of foliage along the way, including maple trees, quaking aspens, and a mixture of wildlflowers, all of which change color with the seasons. Some of the plant species found in the canyon are rare. Also, toward the lower third of the canyon, are outcroppings of giant quartz monzonite and granite boulders. The outcroppings –several hundred feet high in places – serve both recreational (rock climbing) and building purposes (Salt Lake City’s downtown Mormon Temple was constructed with these boulders). There are a number of pullouts to camping areas along the road. At mile 6.7, 2.8 miles up the canyon, enter the stretch of road known as the “Seven Sisters.” Although it sounds as if there might be a tale of folklore associated with the name, the reference is to little more than a series of seven curves that the road steeply negotiates. Tanner Flat campground is at mile 8.2 – a recognizable benchmark because of the two near 90-degree bends that the road makes here. If you can crane your neck away from the road while riding, for a split second or two, notice the scenic, dramatic, steep canyon walls. The first of four entry points to the Snowbird ski resort is on the right at mile 10.0. Although the downhill (!) entry roads to Snowbird are tempting, keep climbing past them. Enter the town of Alta at mile 11.3. Here, at the top of the canyon in rarefied air, is an actual town (population 400); one of the highest in Utah and the U.S. The town was originally established to serve the mining industry, but today skiing, snowboarding and other mountain activities are Alta’s economic drivers. The annual Alta Peruvian Lodge 8K run starts in Alta and heads down the canyon, enabling runners to record some unbelievably fast times. The climb ends where the road splits, at the top of the canyon. The road actually continues from here, but the pavement ends just beyond the next bend, and it is a bumpy, rocky, unimproved surface from there. Turn around here and begin the descent. Please note that the descent is steep, and it is possible to generate speeds that have you keeping up with and even attempting to pass motor vehicles. My recommendation is to avoid passing, but to avoid hugging the narrow shoulder, where fresh rocks may have fallen from roadside cliffs. Maintaining a decent speed might deter motor vehicles from trying to pass you, such that you can have most of the lane. Spectacular views of the Salt Lake Valley can be seen as you descend. At the bottom of the canyon, exercise caution in making the left turn onto State Route 209. Continue to ride in the reverse direction of the outbound route, to return to Hidden Valley Park. For more rides, see Road Biking Utah (Falcon Guides), written by avid cyclist Wayne Cottrell. 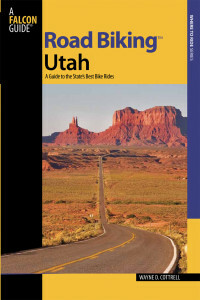 Road Biking Utah features descriptions of 40 road bike rides in Utah. The ride lengths range from 14 to 106 miles, and the book’s coverage is statewide: from Wendover to Vernal, and from Bear Lake to St. George to Bluff. Each ride description features information about the suggested start-finish location, length, mileposts, terrain, traffic conditions and, most importantly, sights. The text is rich in detail about each route, including history, folklore, flora, fauna and, of course, scenery. Wayne Cottrell is a former Utah resident who conducted extensive research while living here – and even after moving – to develop the content for the book.